NEW YORK, September 26, 2018	(Newswire.com) - While it is arguably the most important term in marketing today, entering the word “brand” into a search engine results in many differing definitions. MASB, the Marketing Accountability Standards Board, needed the most accurate and useful definition for inclusion in the Common Language Marketing Dictionary. The Oxford English Dictionary defines “brand” (in part) as: a type of product manufactured by a particular company under a particular name; a brand name; a particular identity or image regarded as an asset. Merriam-Webster’s business definition for “brand” is more limited in scope: a class of goods identified by name as the product of a single firm or manufacturer. “Although branding was historically a concept that was mainly relevant to commercial undertakings, that has changed,” explains Paul Farris, Landmark Communications Professor of Business Administration at the University of Virginia, Darden School of Business. Looking for an appropriate business orientation, the Common Language Marketing Dictionary previously featured “brand” as originally defined by the American Marketing Association (AMA): a name, term, design, symbol or any other feature that identifies one seller’s good or service as distinct from those of other sellers. All of these definitions focus on the physical aspect of brands rather than the intangible characteristics that give brands their value, a critical omission that has been addressed by the International Organization for Standardization (ISO). With significant work on brand valuation and brand evaluation still to come, it’s quite likely that the definition of “brand” will continue to evolve. 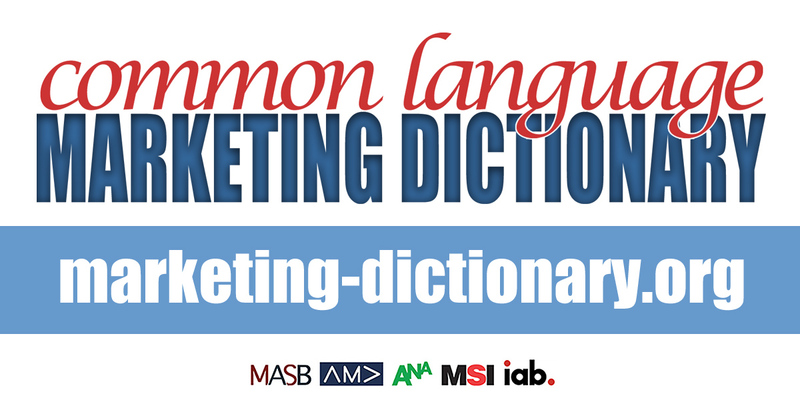 The Common Language Marketing Dictionary (marketing-dictionary.org) is a free, educational resource sponsored by the Marketing Accountability Standards Board, Association of National Advertisers, American Marketing Association, Interactive Advertising Bureau and Marketing Science Institute. Users are encouraged to comment on existing definitions and propose new terms.